About one in ten online health inquiries have a major impact on someone’s health care or the way they care for someone else. 13% of e-patients say their most recent inquiry had a major impact. 44% of e-patients say it had a minor impact. 41% of e-patients say their most recent inquiry had no impact. There are no differences between men and women or among age groups when it comes to the impact of online health inquiries. African American e-patients are more likely than white or Latino e-patients to report that their last online health session had a major impact (26%, compared with 11% and 16%). Seventeen percent of e-patients who report their health status as excellent or good say their most recent online health inquiry had a major impact, compared with 6% of those who report being in fair or poor health. 42% of adults say they or someone they know has been helped by online health advice. In this survey, 42% of all adults, or 60% of e-patients, say they or someone they know has been helped by following medical advice or health information found on the internet. This represents a significant increase since 2006 when 25% of all adults, or 31% of e-patients, reported being aware of helpful outcomes. 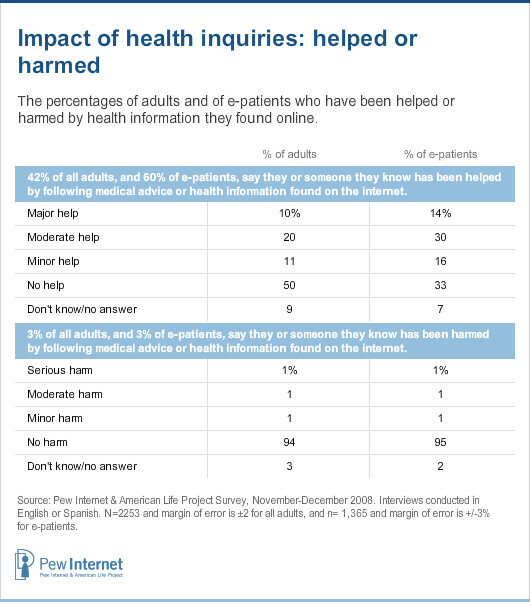 Just 3% of all adults, or 3% of e-patients, say they or someone they know has been harmed by following medical advice or health information found on the internet. This is the same percentage who reported being aware of harmful outcomes in 2006. Looking online for health information is a mainstream activity, but few people are engaged daily or even weekly with online health resources. 81% of internet users say they go online and do something related to health less often than once a week. 9% of internet users say they do so once a week. 6% of internet users say they do so every few days. 4% of internet users say they go online and do something related to health once a day or more. This should not be surprising since 80% of American adults describe their health as excellent or good and therefore have little reason to frequently access health information.